If Emmys were awarded to actors for playing the most bizarre characters on TV, then Naomi Grossman would surely have to clear a space on the mantle. Grossman's breakthrough role of Pepper, the deformed, nearly wordless dwarf on FX's American Horror Story: Freakshow has not only become a pop culture sensation ('Pepper for President' signs, Pepper Halloween costumes) but is a prime example of character acting at its finest. 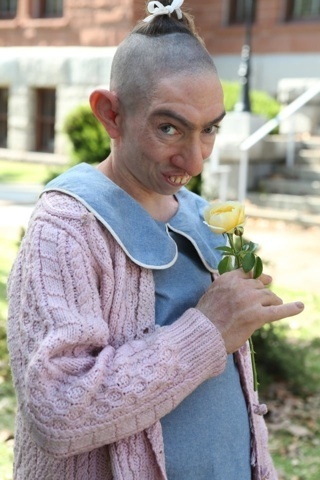 There is a reason that Pepper is the first and only character in all the American Horror Story series to have recurred (seen originally in Season Two: Asylum). And with all the prosthetics and makeup, many have no idea what Grossman's actual face looks like, but that hasn't stopped the actress from catapulting to #1 on IMDB.com for a few weeks in a row. Yes, that's right - number one. Xaque Gruber: The character work you're doing feels rooted in the brilliance of Carol Burnett, Lucille Ball, Lily Tomlin, Gilda Radner and Imogene Coca. Bless you for saying that! You've literally just named my favorite five women in the world. I don't think you could possibly say anything nicer to me! I grew up with each one of them taped to the inside of my locker. While the other girls were teasing their bangs a la Debbie Gibson, I was practicing Carol's Tarzan yell. That's just me. XG: Did you grow up at all a horror fan? NG: Not per se. I grew up in a very cultured, intellectual household. My parents were extremely passionate about art, music, theatre... So that was my world. XG: Freakshow has been my favorite season of American Horror Story so far. NG: Mine too. But then, I'm too close to judge it. My perspective is based on not just what I see on TV every Wednesday, but the overall experience. Watching and living it are altogether different. XG: You actually tune in every Wednesday? NG: Of course! I want to make sure I'm not on the cutting room floor! XG: I guess I assume actors don't necessarily tune into their own shows ever since I read that Maggie Smith has never seen Downton Abbey. NG: That's crazy-- how can you give of yourself so, then not be curious to see how it all turns out? I mean, I know the skeleton from having read the script, but I want to see it fleshed out with the magic of editing and music, complete with its glorious, stylized camerawork. We shoot so much footage-- they could cut this show a million different ways-- so it's interesting to see what makes the final edit. I usually gather with the freaks, and we watch it somewhere together, which has got to be entertaining for fans as well: watching us, watch ourselves. XG: You've become extremely well known for Pepper, who is completely unlike you physically. 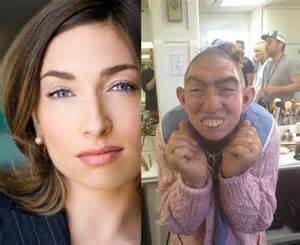 So after American Horror Story, your face will still be a new face for people- because you're Naomi Grossman, woman of a thousand chameleonic faces. NG: Which is what I've always wanted to be! Again, I go back to Lily and Carol. To me, a truly great actor is one who is able to transform him or herself - not just a pretty face or charismatic personality who's playing him or herself for the millionth time. XG: And there are probably a lot of people out there who think Pepper is really an actress who looks like that. NG: Ah, and what a great complement that is! It's funny when people ask me, 'Aren't you afraid of being typecast?' I wonder, why would anyone think of me as an odd, creepy, dwarf-like character? I am nothing like that. Not to mention, that would make for a very sad career, seeing that Pepper's the first of her sort we've seen on screen since the 1930's. I definitely can't go another 80 years without a next gig! XG: Which of Pepper's prosthetic head pieces is the hardest to wear? NG: My least favorite would be the contact lens, because it's so disorienting. I only see half of what's around me, which make scenes with lots of moving pieces especially challenging. Nevermind connecting with your scene partner. And then there's the nose - you have to remember to blow before they put that on, and can't for another twelve hours. I can't hear real well with the ears, and I definitely can't text or even go to the bathroom with those big man-hands. The teeth make me glad I don't have much dialogue, and of course the heat escapes right out of my bald head. Not that I'm complaining - it's a small price to pay for such a great role. XG: Did you watch the movie, Freaks, as part of your research for Pepper? NG: Of course! On a loop! XG: And something people might not realize is what Pepper has is an actual medical disorder. NG: It's a neurological condition called microcephalia. Though it's very rare, I have seen it. I was sitting in a movie theatre, and who sat right in front of me, but a real, live microcephalic. Mind you, this happened while I was shooting Pepper in American Horror Story: Asylum. I mean, what are the chances? Was it just a coincidence? Or was she sent to me by the acting gods? Did she know who I was, and hate me? I knew better than to stare-- and yet, where else am I supposed to look during a movie? I don't even recall what the film was-- I was so obsessed with her Pepper-esque silhouette. She cuddled with her two companions, laying her little head on their shoulders. It was a great character study. I attempt to channel her every day I work. XG: Were you surprised that Pepper returned since this has never been done before in the series? XG: What do you think is Pepper's take on Twisty the Clown? Is she scared of him? Does she see him as one of her kin? NG: I believe that Pepper's outlook on life is based on love. Everyone's a friend, even Twisty. I think that's what makes her so special, particularly given the dark, twisted world that surrounds her. XG: So I have to ask about being #1 on IMDB - what is that like? NG: It's outrageous. It would be one thing if it were some weird algorithmic fluke, but it's been an entire month now that I'm in the top five. Finally, last week no one died... No one changed faces... And I made #1. I'm still waiting for Ashton Kutcher to jump out of the bushes and tell me I've been Punk'd. XG: Can you tell me who you buddy up with in the Freakshow cast on the set when you're not shooting? NG: Mat Fraser, who plays Paul the Illustrated Seal, is a kindred spirit. He and Erika Ervin (Amazon Eve) and Ben Woff (Meep) and I used to frequent the clothing optional Country Club when that was still a thing. Rose Siggins, who plays Legless Suzi, and I have a special friendship, ever since Pepper got caught on video making out with her dummy. And Jyoti, who plays Ma Petite, and I speak our own little language, which is important since she doesn't speak English and I don't speak Hindi. Lest we forget Evan Peters, Angela Bassett, Michael Chiklis, Kathy Bates... They're all so supportive and lovely. And Jessica. Man, it's like watching an acting master class everyday on set. I'm still in awe of her. XG: And this is the first time in the history of American Horror Story where fans can feel comforted in knowing that a character (Pepper) is not going to die because we first met her in the future in Season Two (Asylum). NG: That's true! Best part of a prequel: I can't die! How's that for job security? I actually have the fans to thank for that. Anymore, with Twitter and fan sites and all the various message boards, the audience speaks, and the producers listen. And based on their findings, they're writing the script! I have no idea how this story ends.